Attention all comic artists–be you a professional, a semi-pro or just an amateur dabbler!! In addition to constantly honing your craft, most of you are true students of the art. You pour over your favorite comics and pick up pointers from the published work of your favorite artists. 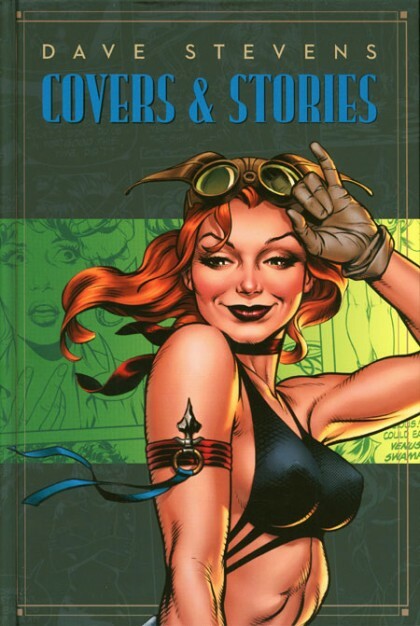 For those of you whose art focuses on either humorous comics or in spot illustrations, I’d like to draw your attention to a series of books you may very well have overlooked. 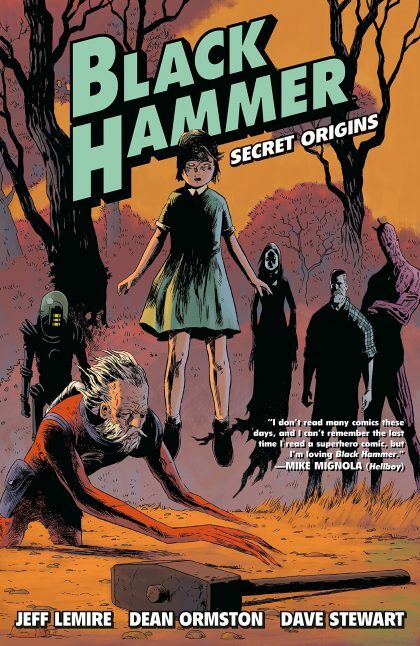 And if that is the case, you need to be made aware of a true comic master at work! 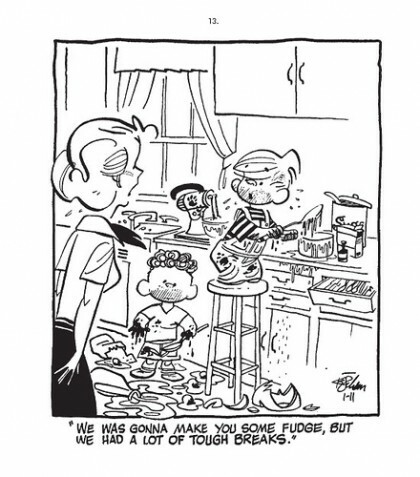 He is Hank Ketcham and his work is on full display in 5 volumes of The Complete Dennis the Menace. How often have you read a single panel cartoon that made you laugh out loud and you just took it for granted? The success of a single comic relies on the picture and the caption to complement each other. Chances are good that neither of the elements are funny by themselves, but combine the two and you have a successful comic. But there is another ingredient– that less is more— so every figure, every line, every expression has to add to the joke and anything superfluous is left out. Every detail has to support the joke. The layers may work on a subliminal level, but work they do! To prove this theory and to show just how incredible Ketcham is, I’ve grabbed three classic panels–at random!– from the heyday of Dennis the Menace–1950-1960. These single panels are more than just (really) funny daily comics, they also provide the viewer with a master class in getting the most effect from a single seemingly simple drawing. We’ve seen this joke before, but what makes this little masterpiece a success is the combination of anger on both their faces. The father is holding the scissors rather threateningly (god bless the 1950s! ), but The Menace is just too tough–he won’t back down and it is a fair bet, revenge lies somewhere in the near future. The refrigerator, nice window treatment and household plant suggest that the Mitchell’s are not on a budget per se. Chances are very good that Mr. Mitchell has to give his son his haircuts at home because ol’ Dennis has been barred from the local Barber Shop. Just look at all the hair on the floor. The struggle has obviously gone on for a while, but Dennis’ hair still has the trade mark cowlick. This kitchen spa treatment has a way to go. This is just round one. And finally, ‘cheapskate‘ is a great word especially coming second handed from the mouth of a soon-to-be-avenging 5 year old. All this works on your brain without you realizing it. Impressive! Wow–where to start?? Mrs. Mitchell is so mad, the hand drawn frame cannot contain her anger. Judging by their five o’clock shadows, the boys have been regularly tasting their little culinary disaster as they went along. The look on Dennis and Joey’s faces says it all– for once, this is not the result of a devious act. They obviously meant well. They tried to clean–look at the sink– the water is still running. Dennis is in excuse mode, but Joey looks like a boy already convicted and sentenced to Junior Jail. He looks directly at the reader in a plea for clemency. Finally, the caption is only 15 words, but each one is perfect for the gag. All this combines to make a clever cartoon into something more. Much more. The look of triumph in Dennis’ eyes. The anger, bewilderment and exhaustion of Mr. Mitchell. Once again, he has a rather dangerous sharp object pointed at Dennis–hey, it was a different era! Between the angry shaking of the seed packet and the dog’s blank expression, the drawing begins to add layers to an already funny panel. The inner tube suggest idyllic summer day–now gone horribly horribly wrong. And right in the middle of this tragedy we have Ruff who is the antithesis of the Greek chorus. He knows what Dennis did, but he isn’t talking. Answer Me demands Mr. Mitchell, but frankly, I don’t think he really wants to know what Dennis did. Nor do we. It is too horrific–but really, really funny! Outstanding! This drawing–the cover to volume 5– doesn’t even need a caption. The mishap causes a smile, but it is the face of our little antagonist that makes it special. Does he tell his Dad and ruin this father and son bonding moment and get punished? Who knows? Are those sweat lines coming from Dennis’ head or is it part of the lake; it’s both! Ketcham the multi-tasker! Alton Brown would be proud! 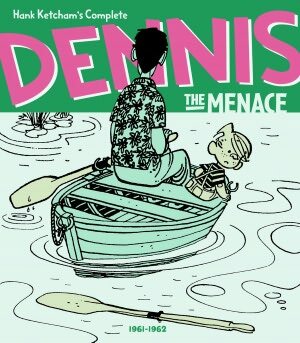 So, pick up any of the 5 volumes of Fantagraphics The Complete Dennis the Menace. 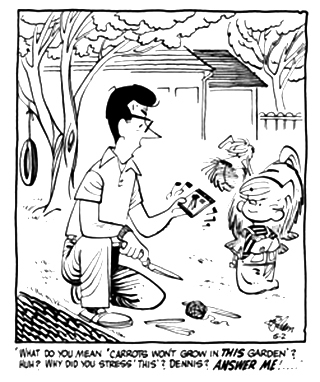 Each volume contains two complete years of Dennis The Menace Daily strip. Many of the panels are laugh out loud funny. But more importantly, any volume can be used as a reference book. These are books you will keep forever! Enjoy! !